This Blog is about famous jain personalities who has made tremendous Contribution towards Society.This is a place to get latest news about Jains, Jainism and related issues. This includes religious, academic and social news. You will see latest news on top, and an archive too. Once upon a time, there lived a poor mother and her son in a small village. One day, there was a festival in the village and all the kids, including the poor son gathered to play. After playing, everyone started to eat kheer (sweet rice pudding and milk) which they brought with them from home. This poor boy did not have anything with him. He felt bad and ran back to his mother. He asked her if she would make him the kheer since all the children were eating it. His mother said that she could not make kheer and told him to eat whatever she had cooked. He started crying and insisted on the kheer. His mother did not want to see him cry, so she went to the neighbor's house and borrowed some milk, sugar and rice to make the kheer for her son. She poured the kheer into a dish and left to get the water from the well. As the boy was about to start eating, he heard the words, "Dharma Labh," (meaning, you be blessed with the spirituality, usually spoken by a Jain Sadhu). He saw a monk at the door for the alms (food). 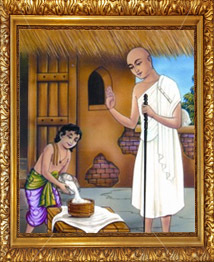 Without any hesitation, the hungry boy invited the monk in and offered him the kheer. While pouring the kheer all of it slipped into the monk's pot. He was happy that he could offer this to the monk even though nothing was left for him to eat. His good intention brought him good karmas, and in his next life, he was born as a famous Shalibhadra. Shalibhadra's mother was Bhadra Shethani and his father was Gobhadra Sheth. His father had left the house when the boy was young and became a monk. Shalibhadra was a born multimillionaire. His life was like being in heaven. It was said that even the heavenly angels were jealous of his lavish lifestyle. He had 32 beautiful wives. His mother never let him out of his palace in a fear that he might become a monk like his father. One day, some merchants from Nepal came to sell some very expensive sarees. 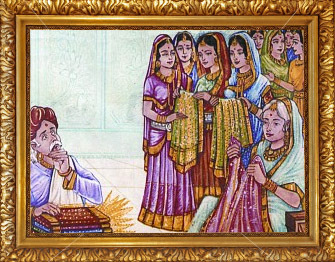 They went to King Shrenik's court where the king told them that he could not afford to use his citizens' money for such expensive sarees. They were going back with disappointment because they had the high hopes about this city. When Bhadra Shethani came to know about this, she sent for those merchants. The merchants were reluctant to go because if the King could not buy, how any resident could buy such expensive thing. But they went there anyway. Bhadra Shethani asked, "What do you have?" They said they had sixteen sarees. She said, "Only sixteen? I need thirty-two saris because I have thirty-two daughter-in-laws." The merchants thought she was joking and would not buy even one. She said, "What are you waiting for. Take out those sarees." They took out those sixteen sarees. The merchants were surprised that without any second thought she bought all sixteen sarees. They were further dazed to see her tearing such precious sarees into two pieces in front of them and giving a piece to each of her daughters-in-laws to wipe their feet. The merchants were stunned but left with joy. The daughters-in-laws used these pieces once and threw them away. One of the servants of Shalibhadra took one of the pieces for the Queen. The Queen was surprised but happy that such rich people lived in her Kingdom. She told this to King Shrenik. He also felt very proud of such rich people who uphold the good name of his Kingdom. He invited Shalibhadra to his court to honor him. When Bhadra Shethani found out, she went to the King and told him her son was very shy and invited the King to come to their palace to honor Shalibhadra. King Shrenik accepted the invitation and went to Shalibhadra's palace. When King Shrenik reached there, he realized that his palace was nothing compared to Shalibhadra's palace. Bhadra Shethani offered him a place to sit and asked Shalibhadra to come down to see the King. Shalibhadra did not know anything about King or Kingdom and thought that there was some sort of merchandise that his mother wanted to show him. So he said, "I do not want to see that but go ahead and buy it." His mother said, "This is not the merchandise. He is our King, our master, and you need to come down to greet and honor him." The word "master" started ringing in his ears. He wondered, "Why should I have a master over me. I should be the master of myself." While thinking like this, he came down, and paid respects to the King, but he could not stay very long and went back. He kept on thinking that he was not free because there was someone over him. He started to think about his father (who had become a monk) and the real meaning of life. He decided at that moment to become a monk and told his family about the decision. His mother and wives tried to convince him to spend some more time with them and maybe later think about it. But he did not listen. At last, he agreed that instead of leaving all thirty-two wives at once, he will leave one wife at a time, and then he would definitely become a monk. He started to do that the very same day. A few days passed by. One day, his sister Subhadra was giving her husband Dhanna a bath and suddenly tears rolled down from her eyes and fell on him. He looked up, and saw his loving wife crying. He asked her what had happened. She told him that her brother had decided to be a monk and he had been leaving one wife every day. Dhanna laughed and told Subhadra, "Her brother was a coward. If he wanted to leave his wives, why wait?" Subhadra was upset to hear that, and told her husband, "It is easier said than done." This sparked awareness in Dhanna's mind, and he told her, "I am leaving all eight of my wives right now, and I am leaving right now to be a monk." Subhadra was taken by a surprise. She told him that he must be joking. But Dhanna said, "It is too late now. I am determined to be a monk. If you all want to join me you are welcome." Seeing Dhanna determined, Subhadra and the rest of his seven wives, also decided to become nuns. Now, Dhanna came to his brother-in-law Shalibhadra's place and challenged him, "Hey coward! If you really want to leave the family and become a monk, then what are you waiting for? Join me." Shalibhadra heard and accepted the challenge. He told his wives, "Sorry, but I am leaving you all today." He went down to join his brother-in-law. His wives joined him too. All of them went to Lord Mahavir and took Diksha. Umang. Simple theme. Theme images by gaffera. Powered by Blogger.